Inscription: Latin inscription on the lower half of the left page of the open book from De Officiis by Cicero and Latin inscription on the upper right page of the open book similar to a passage in Hesiod's Work and Days, lines 21-26; the inscription is close but not the same as modern translations and the last line seems to have been changed by the artist from a reference to a poet's jealously of another poet to a painter's jealousy of another painter. 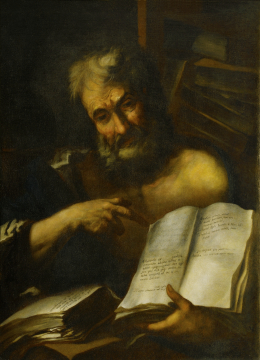 Soane recorded this work as 'Venetian'; Sir John Summerson in the 1940s suggested that it might be Genoese School and suggested Bernardo Strozzi. However, the date 1699 at the bottom of the painting puts it outside his lifetime. Unknown: the picture was in Soane's possession by 1836-37 (it appears in draft inventories of that date).